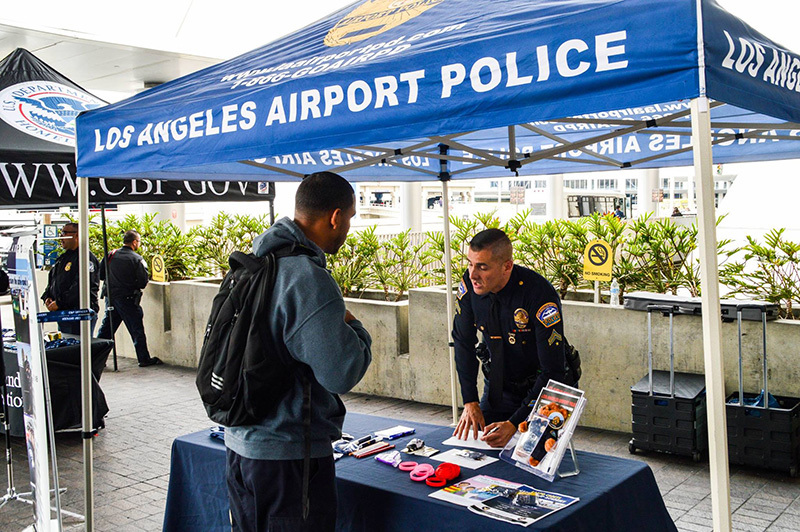 With Los Angeles International Airport (LAX) in the midst of a $15 billion modernization effort to accommodate increased passengers, LAXPD is taking another step to keep up. It’s hiring! What airport police do is vital to the security of LAX, the second-busiest airport in the United States, and Van Nuys Regional Airport, one of the busiest general aviation airports in the world. Officers oversee 200,000 daily passengers, guard against terrorism and protect all airport facilities, surrounding businesses and some residential areas. Interested candidates are encouraged to take a written test offered on the second and fourth Wednesday evening of every month at the airport. Expedited testing is available. The airport’s Police Department is separate from the Los Angeles Police Department, but airport officers must attend the Academy, too. Salaries start at $62,000 and go up to $100,000. Benefits include group medical, dental and vision plans as well as full pay and benefits while in the Academy. Check out www.LAairportPD.com for details and test-taking tips. Just as LAX is modernizing and preparing for more travelers expected during the 2028 Olympics in Los Angeles and the city’s possible hosting of the FIFA World Cup in 2026, we will finally have a new airport police station with the necessary space, equipment and technology to better protect the traveling public. LAAPOA had asked for decades for a new station, and in May, the Los Angeles Board of Airport Commissioners gave the go-ahead. The new headquarters, scheduled to open in 2021, will house operations that currently are being conducted in nine separate locations over 6 miles. The Department is looking forward to moving into the 12-acre site, which will be one of the largest police facilities in North America. The history of LAXPD stretches back to 1946, when it had six officers and one sergeant. A group of LAPD officers was permanently assigned to work with the airport guards, called special officers, after a new passenger terminal opened at LAX in 1961. The state Legislature granted the officers limited peace officer status to help with voluntary passenger screenings in 1968, when more airplane hijackings occurred. By 1973, there were 70 airport special officers and sergeants and one lieutenant. An 82-member force called the Boarding Services Bureau was created five years later because of further concerns about hijackings. Special officers took on more duties when the airport underwent a $700 million expansion to get ready for the 1984 Summer Olympics. During the Games, airport officers patrolled terminals and escorted and protected visiting athletes. The bureau adopted peace officer background requirements and merged with the Security Division to become the Airport Security Bureau. It later was renamed the Los Angeles Airport Police. The Tom Bradley International Terminal and Terminal 1 also opened in 1984. The doubling of passenger capacity and a flurry of overseas hijackings that involved U.S. carriers prompted airport police to grow their ranks and upgrade professional standards. Beginning in 1986, new officers were required to attend a full-length police academy, along with existing officers who hadn’t yet done so. L.A. Airport Police were accepted into the California Commission on Peace Officers Standards and Training (POST) Specialized Law Enforcement program in 1989. The need for a separate airport force became apparent during the 1992 L.A. Riots, when LAPD officers assigned to LAX were pulled away to respond to the unrest. By 2005, voters had twice expressed that the Board of Airport Commissioners, not LAPD or the City Council, should control airport policing resources. Post-9/11 security requirements led the Department to more than double its staff, and in 2004, members were reclassified from special officers to airport police officers. A decade later, the LAXPD was granted the same status as the LAPD and other municipal departments.